For years I’ve used the waffle recipe in the Better Homes & Gardens New Cook Book. I like the recipe because the waffles come out airy and fluffy. However, they sort of fold under pressure…add butter, moisture or syrup, and they tend to go kind of flat, which is frustrating. The last few times I’ve made waffles I’ve used Mark Bittman’s Quick and Easy Waffle recipe from How to Cook Everything and I’m really liking it. This recipe is a little sweeter, and the waffles are a little heavier…but not too heavy. And they keep their shape and crispiness, no matter what you throw at them. Oh, and they’re easy, making this recipe great for a last minute meal. It’s my new fave, despite how beloved the Better Homes & Gardens recipe is in my heart. In another bowl, melt butter in microwave. Add milk, eggs and vanilla and whisk well. Stir the wet ingredients into the dry ingredients. If the mixture seems too thick, add a little milk. (I always start off adding 1½ cups milk as directed, but generally had another ¼ cup or so at this point.) You want the batter to remain slightly lumpy. Cook in the waffle iron as you normally cook waffles. Enjoy! 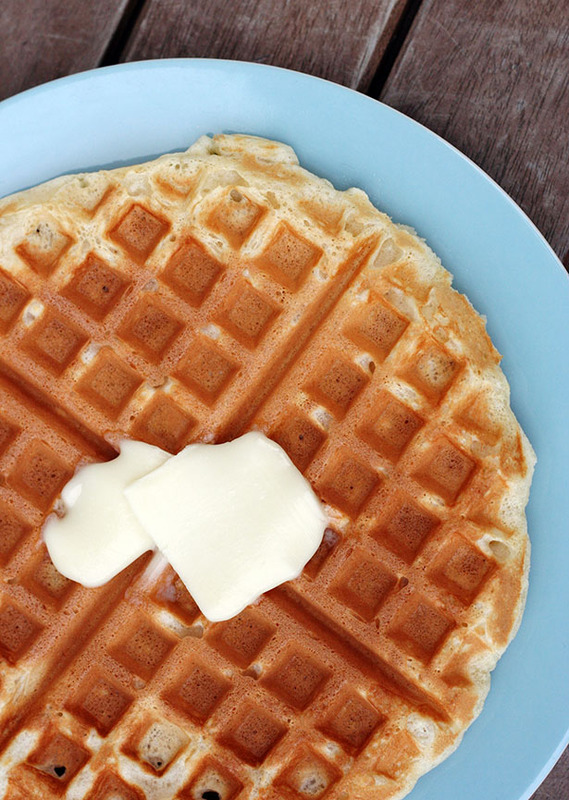 This recipe works well in both classic and Belgian waffle makers. I love How to Cook Everything. It’s been my go to cookbook when I give gifts to young relatives getting started cooking on their own. I don’t think I have tried this recipe yet. Did you use a standard or a Belgian waffle iron? matt – totally, it’s such a great book! as for the iron – I used a standard waffle iron…I think this recipe could work with the belgian, too, though. We make Belgian Waffles every Sunday with the kids. In the beginning I tried different recipes. After trying Mark Bittmans I stopped. This is by far the easiest, and tastiest, waffle recipe. It never screws up and you can add anything you want to it. I usually throw in a handful of oats just to make the waffles a bit healthier and heartier. I have also found that I need to add a bit more milk in the end. My husband has worked with a recipe that is now so wonderful. He uses buttermilk and a handful of rolled wheat. They have a great texture that is tender and doesn’t fall apart. He might have started with the BH&G…but I am not positive. I don’t know how to tell you this…try the Cook’s Illustrated Yeast Waffles! My life will never be the same! ha! love your comment, kel! I will have to try them. mark bittman also has a yeast recipe in this book right before this one…I’ve had it and it’s delish. I’ll have to track down the cook’s illustrated to compare. I ended up having these for dinner last night with some fruit(the fruit makes this a healthy meal right). These worked amazingly well as Belgian waffles. awesome! great to know! I kind of thought it would work well…yea! We made these this morning for my daughters 10th birthday. They were loved by all. Super easy and great to work with batter. great recipe! thx for sharing! This is the same recipe that I often use for waffles. But to this I add some cinnamon and I use buttermilk instead of regular milk. It is just so good. You should also try the yeast-ed waffle recipe in same cookbook (How to cook everything by Mark Bittman). It resulted as the one of the best waffles I had ever eaten. I’m sure of that. I usually make sourdough waffles, but this looks like a great quick & easy recipe for the times I don’t have enough sourdough starter on hand. When I make waffles, I freeze a few. snap in half and pop in toaster for a quick breakfast during the week. They reheat very well. BTW, I just started meal planning and heard about your site from Ellen Patton. It looks great. I’m glad you’re liking it as much as I am – I haven’t made my other waffle recipe since I wrote this post! Thank for the recipe! Tried this morning for my honey’s b-day but just didn’t work out. The texture is too heavy…dense (even after adding more milk). I’m still searching for a light crisp, golden tasty waffle recipe. I love this blog! I was trying to look for the 5under5 blog someone suggested above, but the pop-up reflected it was by invite only. sorry they didn’t work out! I do always add more milk than the recipe, and I like that they are a little heavier. 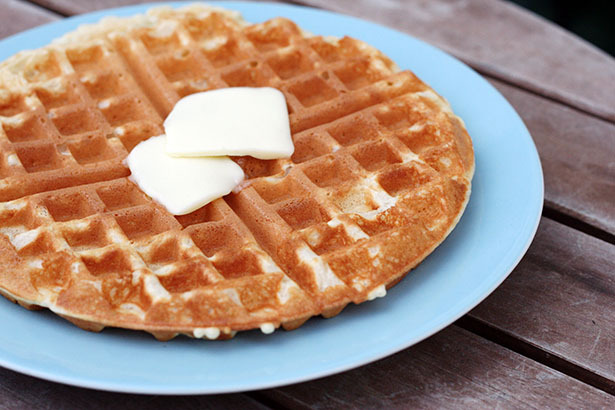 this recipe https://thisweekfordinner.com/2007/01/31/waffles/ is MUCH lighter and fulffier – you should definitely try it! thanks for the quick recipe. I usually use the one out of Cooks Illustrated, which makes amazing waffles, but requires separating the eggs and beating the whites and seriously, who has time for that. These are close to as good and way faster. This is one of my favorite recipes from How to Cook Everything. The binding broke on mine so I have this page bookmarked. I wanted to offer one suggestion. Even when I used the recipe from the hard-copy, I started warming the milk a little bit in the microwave. This allows you to put the melted butter in while it’s still a little warm without it forming butter crystals. These crystals will form when the milk is cold and the butter is warm. excellent tip, derek. thank you! These waffles are the best! I eat them almost every morning with my two kids. If you add 3 and a half cup of milk,it is nice flaky. It’s not too heavy either! By the way,I love the pictures. They look almost like the waffle when you make it! Great recipe they turned out great!!! I followed exact recipe minus the extra milk. Batter was to runny and had to cook longer to get moisture out which started to burn waffles. Added a tsp of flour to thicking the batter and it poofed up waffles in waffle maker and kept popping lid open.